(4 Customer Reviews) | Write Review 12 issues per year Always packed with the latest kit previews, full kit builds and how-to features Model Airplane sets the standard for modelling excellence and photography. Every issue has superb kit builds with how-to sections to help improve your modelling skills. The very latest releases and industry insider news on accessories and upcoming releases keep the reader up to date with the latest info. 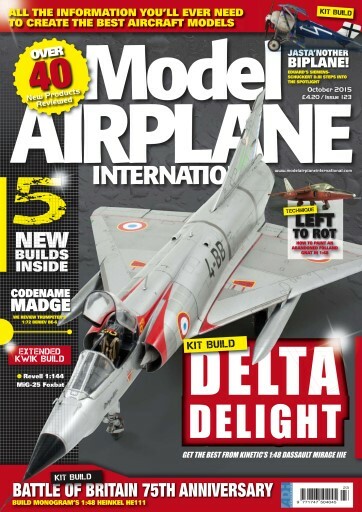 If you want the very latest news on kit releases and to be shown how to improve your modelling skills - Model Airplane International is a must read. kit through to their latest release. of this beautiful aircraft, Kinetic’s 1:48 offering. Always packed with the latest kit previews, full kit builds and how-to features Model Airplane sets the standard for modelling excellence and photography. Every issue has superb kit builds with how-to sections to help improve your modelling skills. The very latest releases and industry insider news on accessories and upcoming releases keep the reader up to date with the latest info. You'll receive 12 issues during a 1 year Model Airplane International magazine subscription. Model Airplane International is a good mag for airplane modellers full of ideas. Would have been even better if pics was of better quality. When zooming, it become terrible. You'll receive 12 issues during a 1 year Model Airplane International magazine print subscription.